You Say Party, We Say Sigh…. Things aren’t looking too promising in the Bloc Party camp right now. The London based four piece have already confirmed that this ‘Bloctober’ tour will be their last before a lengthy hiatus, and recent quotes from drummer Matt Tong suggest that he may not be re-joining the band when they return. Tong’s absence would be a massive blow for a band who have faltered somewhat since the release of their excellent debut, ‘Silent Alarm’, four years ago. 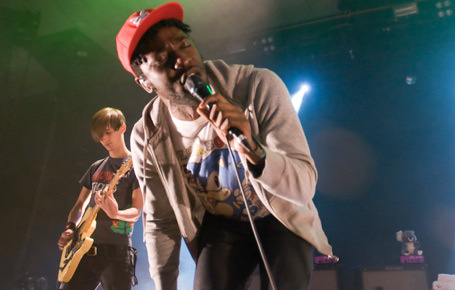 Indeed, perhaps the biggest problem with follow up ‘A Weekend In The City’ was just how far Tong’s incendiary skin work had been pushed into the background in favour of Kele Okereke’s vocals. It would be a real shame if they were to break up completely, and possibly an even greater shame if they chose to carry on without one of the key elements that made them so interesting in the first place, as there are moments tonight when they sound like the best band in Britain. Sadly, there are also times when they sound utterly uninspiring and pedestrian, and it remains to be seen which of these elements will ultimately win out. 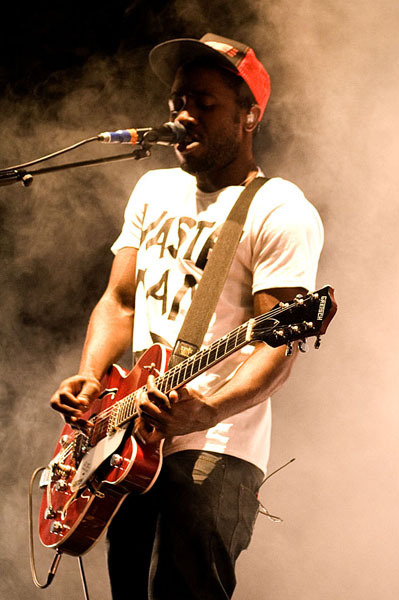 Clad in a white ‘Waste Man’ t-shirt and peaked cap, Kele bounces onstage to a rapturous reception as the band take their positions for opener ‘Waiting For The 7.18’. It’s a bit of a strange choice to open proceedings, but works about as well as any song about waiting for a bus can expect to, mainly due to the closing refrain of ‘Lets drive to Brighton on the weekend’. It’s followed by ‘Halo’ which ups the energy levels nicely, before the band launch into ‘Positive Tension’, which proves to be distinctly anti-climatic. Much of this is down to the way in which Kele chooses to alter his delivery, deliberately dropping words from the end of lines, and letting others run over into the next. It is a trick he will repeat throughout the night, and only serves to severely disrupt the flow of what should have been a highlight, making it sound rushed and under-performed. Much derided recent single ‘Mercury’ gets an early airing, and perversely is one of the first songs that really shows what the band can do in a live setting. The rolling dubstep style bass line, distorted brass and skittering drum beats manage to dominate the track and ramp up the tension in a way they never quite manage on record, while Kele’s wild feral yelping works better as an addition to the collage of sound, rather than its centre point. This issue becomes fairly crucial throughout the show, as tracks like ’The Prayer’, ‘I Still Remember’ and ‘Two More Years’ drift by in a sea of repetitive vocals and tame instrumentation. It is only when Russell Lissack’s searing guitar is allowed a chance to break through that songs like ‘Trojan Horse’ offer up anything of interest, and sadly this happens all too rarely. When they do get it right however, the results are ferociously brilliant, as an incendiary triple whammy of ‘Hunting For Witches’, ‘Song For Clay’ and ‘Banquet’ aptly demonstrates. ‘Hunting For Witches’ in particular marries thunderous drum beats and bass lines with the menace of Lissack’s descending guitar riff and a host of unsettling sound effects. The band finish strongly with an encore that includes both ‘Flux’ and ‘Helicopter’, which sends everyone home happy. However, the fact that three albums worth of material has only managed to produce a handful of moments that really excelled in a live environment suggests that the band may have stagnated slightly. Hopefully Bloc Party’s planned hiatus will provided an opportunity for members to recharge their creative batteries and come back stronger with some fresh ideas and finally fulfil their early potential.